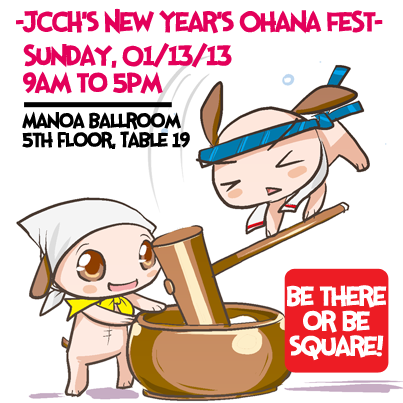 It’s become a bit of a tradition here at Otaku Ohana to kick off the year talking about the annual Japanese Cultural Center of Hawaii’s New Year’s Ohana Festival, and for good reason: Not only are there a bunch of activities that appeals to the Japanophile in all of us — mochi pounding and other cultural demonstrations! Entertainment! Games for the kids! Maximum ono grindage with food trucks and booths galore! — it also serves as the natural launching point for a number of groups and businesses with ties to the local anime and manga fan community. Kawaii Kon: Staff members from the annual anime convention will be on hand for all your convention preregistration needs … and you may stand a good chance of winning a prize at their booth as well. JN Productions and Generation Kikaida: Autograph sessions with Kikaida star Ban Daisuke and performances by Kikaida & Friends (at 11 a.m. and 2:30 p.m.) are the order of the day, along with the University of Hawaii Pep Band and the other usual trimmings that come with a Generation Kikaida party: picture-taking, Kikaida-oke and discounted merchandise. Spend $100 or more and get the Kikaida vol. 1 DVD for free; spend $200 and up and get a Kamen Rider V3 case for your iPhone 4 as well (sorry, cutting-edge iPhone 5 adopters and all of you with Android phones). MangaBento: This group of anime/manga-inspired artists will be holding their first meeting of the year at the festival, sketching activities and photo booth props likely in tow. Yu x Me Maid Cafe & Host Club: The group formerly known as Animaid Cafe Hawaii will have their giant Jenga set and other casual games set up at their booth. Also, I’ve said this before about them and I’ll say it again until the end of this blog, but as inevitable as death, taxes, and President Obama and his family vacationing in Kailua in late December, this dance will probably show up sometime as well. Journey of Heroes graphic novel: Author Stacey Hayashi will be bringing books, chibi T-shirts and other chibi goods based on the characters in this manga-style chronicle of the achievements of the 442nd Regimental Combat Team/100th Infantry Battalion in World War II. For more information, visit www.jcch.com. New this year to the Cel Shaded Report is this weekly feature that will highlight all of the events on my radar that may be of interest to local fans. It’s kinda like “More From the Anime Desk,” except featuring events that are more than a week out (and with more of an emphasis on events, period). Don’t be surprised if the title of this feature changes next week, by the way; I’m … not exactly enthusiastic about it. Otaku Fair at Shirokiya: Hosted by Hakubundo Bookstore with volunteers from the University of Hawaii at Manoa Anime Manga Society. Pick up art books, Japanese-language manga, posters and assorted character goods. (I swung by there on Wednesday, and it looked like there were a lot of things related to One Piece, Dragon Quest slimes and Hatsune Miku.) Now through Jan. 27. Liliha Library Anime Art Contest 2012 Winners Reception: Fifty-five entries, 13 winners. Join Liliha young adult librarian Linda Mediati, Audra, Kawaii Kon senior administrator Roy Bann and myself as we honor those winners in a ceremony at the library, 1515 Liliha St. (And if you want to see the pretty artwork that we saw in this year’s contest, stay tuned … I’m going to be working on that two-part post immediately after I put this post to bed.) 10:30 a.m. Saturday. Aiea Library book sale: Book sales are really a media treasure hunt — you never know what you’re going to find. There could be an out-of-print manga volume that you need to complete your collection, or a Pokemon strategy guide in Japanese, or something completely different that you totally want right now. Find your passions here. Presented by the Friends of the Aiea Library and the Aiea Community Association at the library, 99-143 Moanalua Road. 10 a.m.-3 p.m. Jan. 19. “Friends, Books, Music … The Sale!”: You know all that stuff I wrote about the Aiea Library sale above? Apply it to this sale, presented by the Friends of the Library of Hawaii, except on a waaaaaaay bigger scale. Visit the Friends’ warehouse in Kakaako, which is ewa (west) of the UH medical school; just go makai (south) on either Forrest Avenue or Keawe Street to the end, and you’ll be there. Visit www.friendsofthelibraryofhawaii.org. 9 a.m. to 4 p.m. Jan. 19-20 and 9 a.m.-3 p.m. Jan. 21. Madoka Magica double feature: Watch the magical girl saga unfold in one big four-hour, two-film chunk comprising Beginnings and Eternal, Doris Duke Theatre at the Honolulu Museum of Art. Tickets are $20 general admission, $18 museum members. Visit http://www.honolulumuseum.org/events/films/13340-puella_magi_madoka_magica_parts_1_2 . 4 p.m. Feb. 27 and 28. Jason, could you provide, or point to source(s) of, details about HEXXP being defunct? @parv: I don’t know if you can see this, but if you have a Facebook account, point your browser to https://www.facebook.com/groups/278587523952/ and look at the discussion thread attached to the most recent post. In any case, any speculation about the fate of HEXXP 2013 for now is just that — speculation. But the fact that they were selling passes to the 2013 show online during/soon after the 2012 show, only to have the entire website pretty much disappear a few weeks later, strikes me as odd, as well as the fact that I’ve not heard ANY word that the promotional push that existed last year at the Ohana Festival has returned this year.